A few weeks ago I went down to Somerset, MB, which is sort of the middle of nowhere. It was a middle of winter as well, and there was nothing much to look at but some really beautiful trees, devoid of leaves and covered in snow. I wanted to draw it when I got back, and started right out on this charcoal drawing. It looks nothing like the trees in Somerset. It turned out really dark and twisted. It reminds me of the Disney forests in Sleeping Beauty and Beauty and the Beast. I like the dark fairy tale feel, but I think at some point I'll have to retry the original idea. The trees do have just a hint of menace about them, but I love the effect of light in the top part of the drawing - like the sun has come out from behind the clouds. Anyone "lost" in that forest would have a sudden feeling of hope, I think! You're right about the mixture of charcoal - I used to get similar effects with willow charcoal and a charcoal pencil, which will give a very dark and sharp line if you use a knife to make a point on it. You can get an amazing range of "blacks" with that combination. Love the trees! 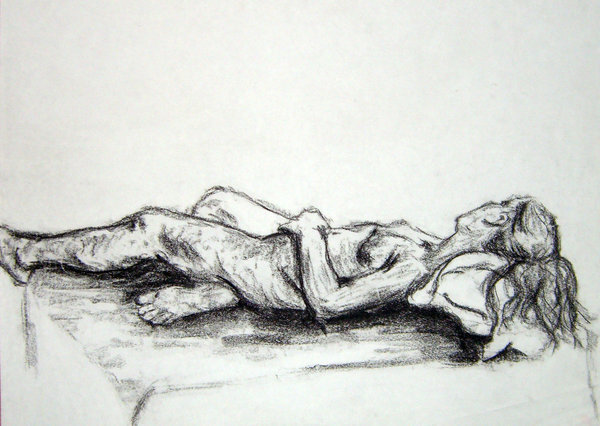 I like the life drawing too - that was from college, yes? A good one!